Notes from the workshop on Global Development, December 13 2008 in Paris. Due to an initiative of the government of Ugande, work for teachers was increased, but salary or facilities were not. So eventually the government refrained from this aproach again. The American NGO Inveneo worked out a solution especially for the circumstances. 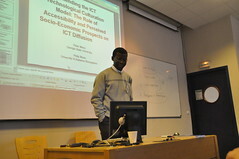 Local ICT experts were also trained. The whole project turned out to be quite successful. – Focus on the teachers – make sure they get paid enough, are well trained and have the right equipment. Do these aspects influence the usage of ICTs? If individuals have access to ICTs they become culturated = familiarized = comforted with ICT -> impacts the usage of technology. Exposure to technology is not by itself important to usage. Same results – email use is not related to technology culturation. 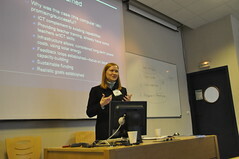 Many nations try to implement e-learning programs at a national level. Technology in education has great potential. 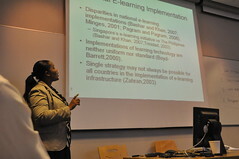 Therefore many countries try to embrace e-learning, but without a clear plan and lacking a clear strategy. Research has in this regard the burden to prioritize efforts. It’s important to include public & private sectors and to conduct trainings on all levels. There should be a clear strategy, but it is uncertain which strategy to use. The presenters approach was, to adapt Soh & Marcuses Model with 3 processes and 4 constructs. The model is currently carried out as a case study in Jamaica and specific constraints are being addressed. Some problems were encountered and are delaying the whole process. Knowledge Management: many definitions – much research -> is it a waste of time? 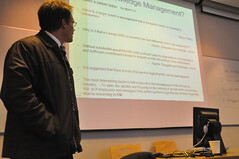 It seems the acceptance and usage of knowledge management determine the success. There are also managerial issues. Approach: a questionnaire was given to companies in South Africa to find out what the true issues are. It seems like we’re using it. Middle & senior management think we need KM. Education industries are not increasing KM. Organizational size & availailty of resources is playing a role – but it has more to do with commitment, especially from middle management. KM is alive and moving beyond information management. The Nari Jibon project is a training program in Dhaka, Bangladesh, which started in 2005. It provides short term training programs for the poor and under-privileged women in the area. The women attending the program are taught English, but the program especially aims to educate them in computer skills. This includes computer office programs, computer repair, graphics & web design, ICT, and photography. The goal of the project is to help poor women develop new skills, which would allow them to earn some money for their livelihood and make them more self-reliant. Last year the project received a grant from Global/Rising Voices for the incorporation of weblogs in their training programs. Using weblogs within classes gives the Bangladeshi women a voice and allows them to enhance their computer and photography skills. It’s impressive to see how enthusiastic women taking part in the program are about their weblogs and how a simple ICT technology, such as weblogs, may help improving the life of people. See the Nari Jibon project website and the Global/Rising Voices website for more information.